Time for some Thursday creativity... and ALL of these cards were made with the same set! Hi Tracy here to share a card. I was in a girly pink mode I think when I made this. I used some glitter embossing powder on the flower from the 'awesome' Awesome Blossom set. Hi, Danielle here. I also used Awesome Blossom, and I paired it with a sentiment from Jibber Jabber. I think those flowers look beautiful embossed in silver! Hello! 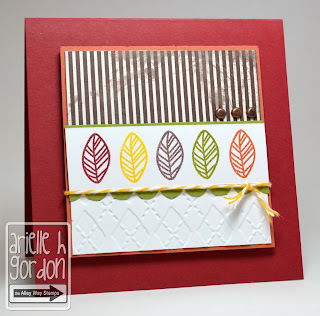 Arielle here, with yet ANOTHER card made with this FABULOUS set, Awesome Blossom! I decided to make a fall card with the leaf image!